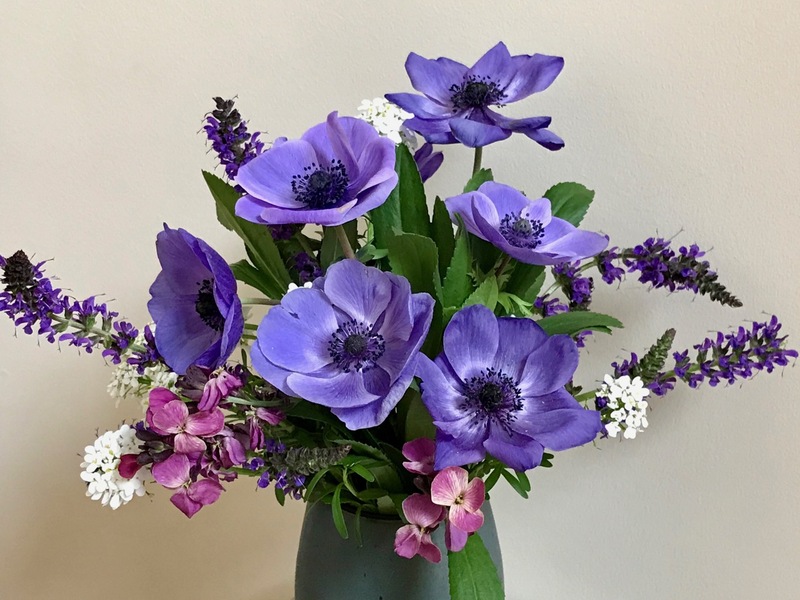 I adore those anemones and one day will perhaps find space for them in my own garden, although I’m sorry to hear they’re so picky about growing. Also loved the non-mechanics of the Shasta daisy foliage – how clever. They are long blooming in the garden so worth trying. Judy, I agree. Just love them. Beautiful purples. You seem to have lots out in your garden already. It’s turned cooler again so spring has been nice and slow. But yes, there are a enough things blooming now it’s easier to find things for Monday vases. I always look forward to seeing Mr. Fokker. He is such a colorful chap and always a good mixer. 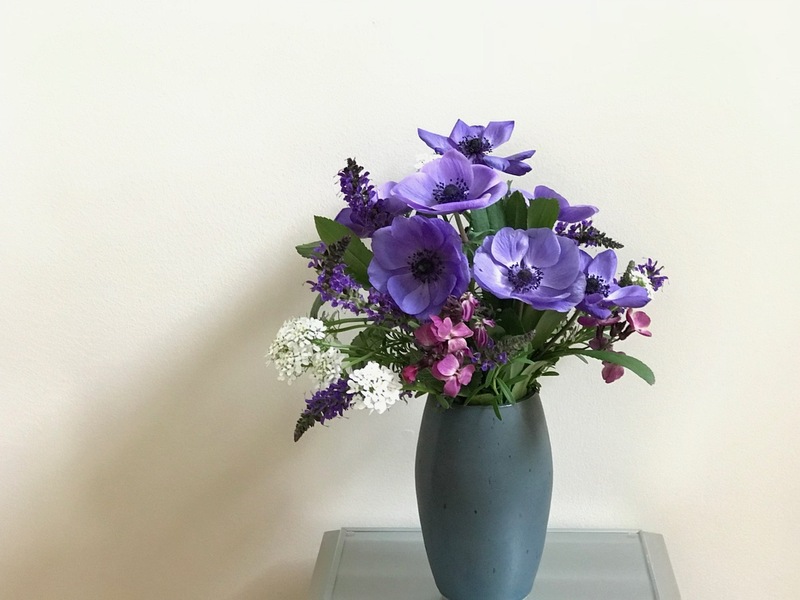 Having any of those Anemones in the garden is a real treat and the look stunning in a vase. I particularly like the way the vase and table seem to reflect each other. Great way to initiate the greenhouse Cathy. I should plant some more asap. The vase was a gift from my daughter and it has a nicely-designed lid, which I should have included in the photo. I will have to look up the potter someday. I love seeing these anemones each spring Susie. They just don’t grow for me. Too hot and dry in summer perhaps? I shall enjoy yours instead! Cathy, I’ll try to keep the anemones going as long as I can. Your gorgeous anemones have me wanting to try some in my own garden. Beautifully combined and arranged as always! Yes do give them a try Peter. They are even better in person. It’s a lovely composition and the pinky tones of the wallflower add just the right amount of contrast. 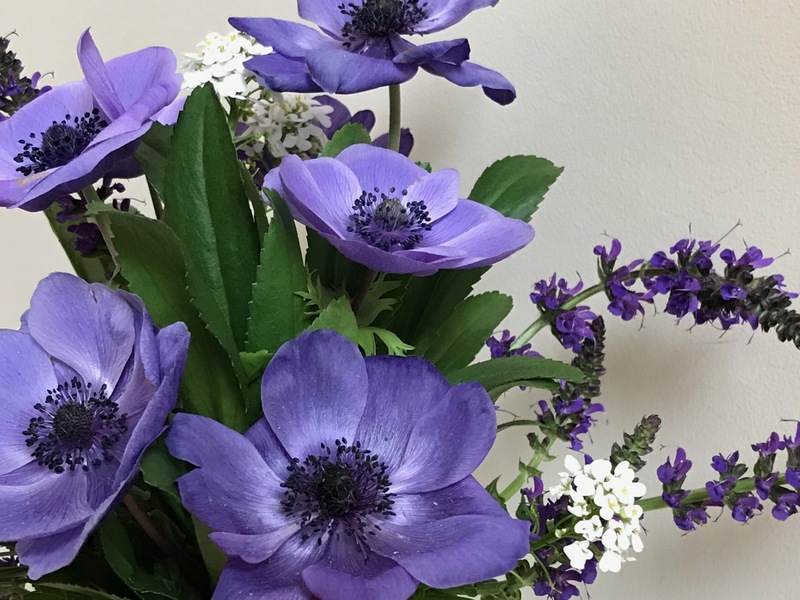 I’ve had a horrible time growing anemones and probably need to accept that they can only be annuals here, and maybe try them in my cutting garden space where they have a better chance of getting the water they need. In any case, I enjoy seeing yours! Thanks Kris. The wallflower has rallied lately. A beautiful arrangement complimented by the vase. The anemones are gorgeous and perfect with the touch of pink. Thanks Alison. I think the pink wallflower helps. 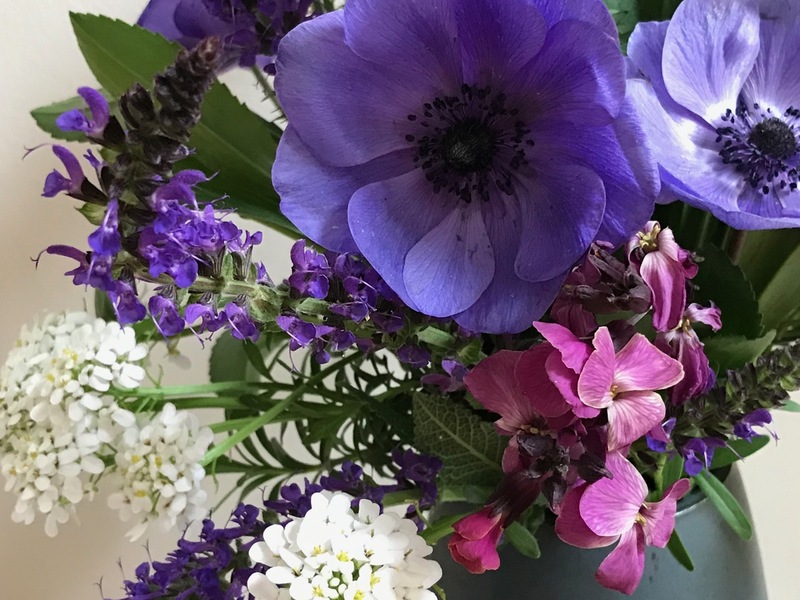 I was just thinking I need to plant anemone again….they are beautiful and absolutely perfect in your vase with salvia. Thanks so much Donna. That salvia has been attractive this spring—better than some years. Oh wow, yeah, those purple-blue Anemones are true lookers! The entire collection looks wonderful in that smooth blue vase, too. Very special! Thank you Beth! 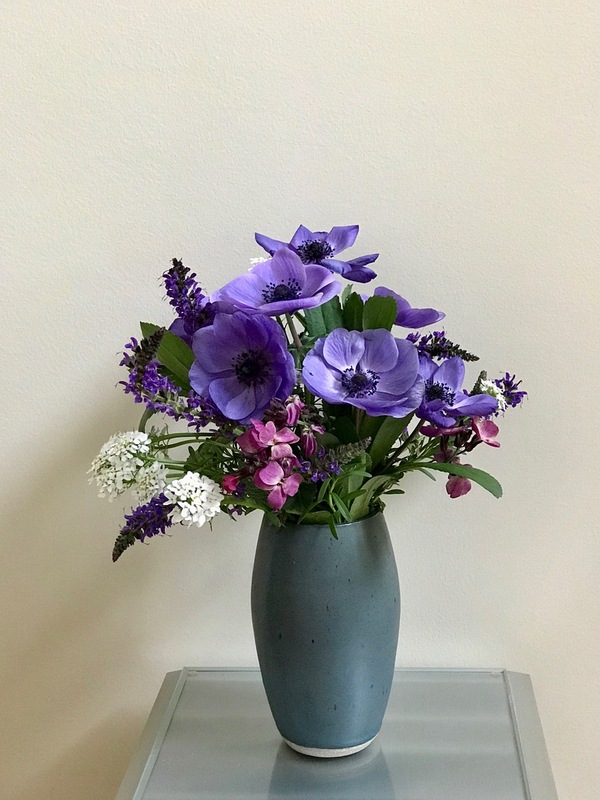 Just learned today at my garden club that blue is the everyone’s favorite color, across cultures and between men and women. 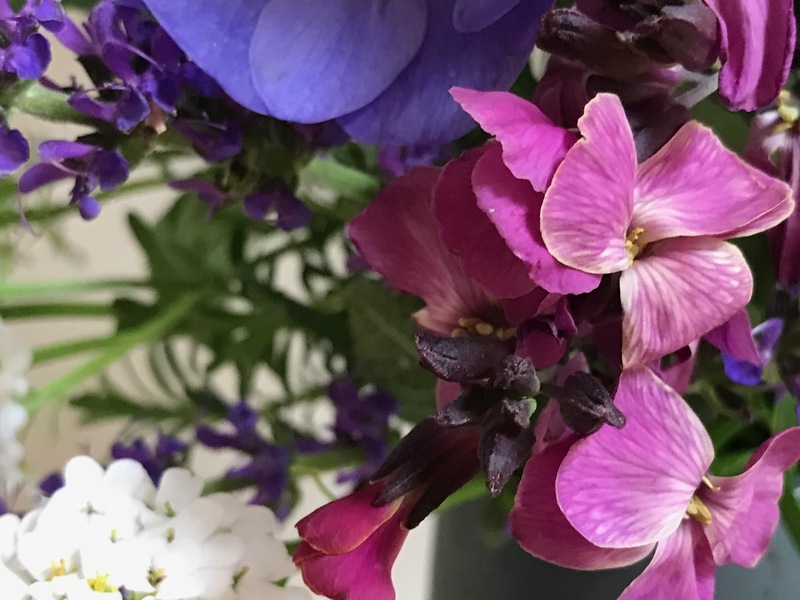 A perfect vase – oh how I love your Mr Fokker. So large, lush and simply blue! The little dainty points of the salvia are a great contrast for that ‘fullness’! Thanks Cathy. Mr Fokker has his appeal. The salvia is doing well this spring. I really like those Anemones. I need to get some for next year. Do you think they would do well in pots? Plant them shallow, in a pot with decent depth – they have quite a deep root run – placing them claws upwards, about 2in deep and about 4in apart. Water them well on planting and then leave them be, checking occasionally that the soil is not bone dry, but don’t overwater. A carpet of blue anemones was the first wow factor this spring but they are the short-stemmed variety. Must remember to go for some of these for cutting. Not sure I could use them as artfully as you always manage to do. And I should try your carpet of blue anemones Ricki. Sounds so lovely.